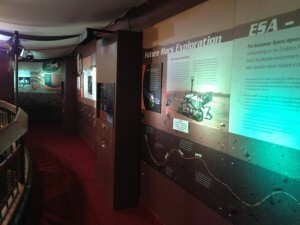 Take a walk through the history of Mars exploration! Blue Planet Red Planet is an interactive timeline highlighting the key milestones in our study of the Red Planet. Recently relocated to our mezzanine, this exhibit was funded by NASA and is part of the Blue Planet Red Planet Project. Check back frequently for new videos and pictures from NASA’s newest robot explorer, Curiosity. Support for the Blue Planet Red Planet exhibit at The Children’s Museum made possible under Grant No. NNX10AK13G with the National Aeronautics and Space Administration. Any opinions, findings, and conclusions or recommendations expressed in this exhibit are those of the author(s) and do not necessarily reflect the views of the National Aeronautics and Space Administration.